There are four of us that survived highschool with our friendships intact. The Four Amigos, the Four Horsewomen of the Wine-Induced Apocalypse (Haha, okay, I just made that up now, because I'm an idiot. We've never called ourselves that. 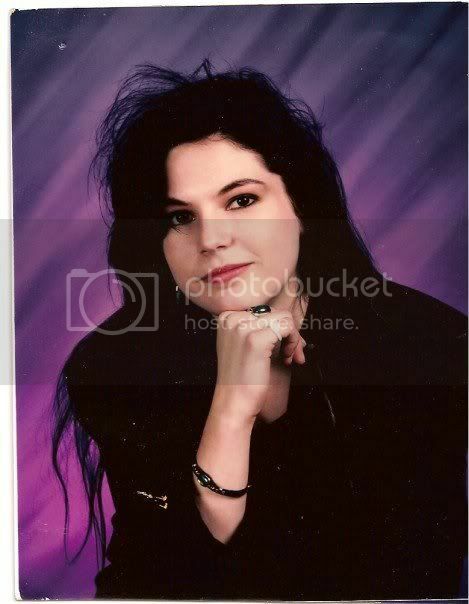 But if we did, my highschool grad picture makes it pretty obvious who would be Death). (So many thanks to my friend J for digging that up and posting it on Facebook, where 30-somethings go to compare themselves to people they went to high school with, and subsequently feel inadequate). Anyway, if you read my other blog at all you've probably already met Force of Nature. She's the kind of person you always want on your side...because you wouldn't want to go up against her. She's a masterminding, event planning, steamrolling mama bear of three. And she's totally in your corner. The only one of us to escape this little patch of dirt and head for the coast is Politika. I'm calling her that because to me, wishy-washy non-partisan that I am, it seems like everything with her is political. Not in a bad way. Just in a very informed, articulate, exacting, opinionated way. When FoN and Politika get together, you can dry your hair off the whirlwind they create. The fourth member of our quartet I was going to call Limp Noodle. Conversations with her are often a variation on the, "What do you want to do?" "I dunno, what do YOU want to do?" theme. But I've recently come to realize that she makes things happen just as deliberately as FoN, just without broadcasting. What she IS is an incurable romantic; she's in love with the idea of being in love. Everybody has a friend like her, who is sometimes exasperating because every relationship she is in is The! One!, but who restores your faith at the same time. So she's Valentina, and she's this weeks superhero.